As you likely know, tomorrow afternoon is the Dodgers first Spring Training game. In preparation for the big day, they posted up the anticipated lineup for the game this morning. Check it out in the photo above tweeted out by ESPN reporter Mark Saxon. 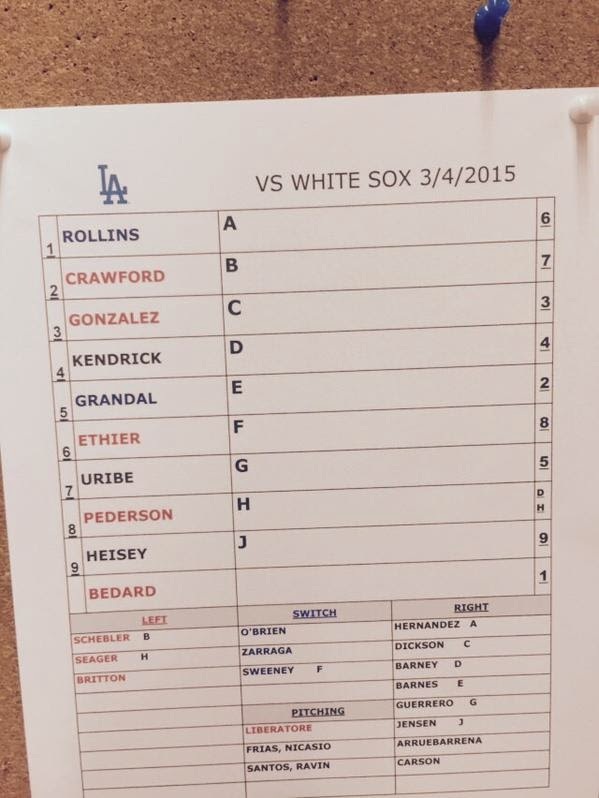 Clayton Kershaw will be #Dodgers Opening Day starter. Mattingly: "That's our plan. ... We were just waiting for you to ask." Via J.P. Hoornstra at Inside the Dodgers, "Jimmy Rollins met with Yasiel Puig for two hours." JP Hoornstra also wrote about Brandon League at the Daily News, "Los Angeles Dodgers reliever Brandon League credits giving up alcohol to boost in energy." Via Ken Gurnick at MLB.com, "Ryu, Peralta feel good after bullpen sessions." Everything seems fine and on schedule. Via Jon Weisman at Dodger Insider, "Hideo Nomo remembers first day in Dodger uniform, 20 years ago." Today is the 20th anniversary of the day Nomo first put on a Dodger uniform. Roberto Baly at Vin Scully is My Homeboy informs us about an interesting upcoming event: "The Baseball Reliquary Presents Turning Back the Clock: Baseball in Los Angeles." John Thorn at Our Game, "Diamond Visions: Baseball’s Greatest Photographs." I couldn't agree any more with Grant Bisbee of SB Nation's assessment of Juan Pierre's legacy: "Dangit, Juan Pierre, we'll miss you." He was The Departed of players, not nearly as good or awful as its greatest supporters and detractors claim. Paul Post at Sports Collectors Digest writes a fantastic article on former Major Leaguer Jim Abbott: "Player Interview: Jim Abbott Talks No-Hitter, A-D-A-P-T."